Blog Home » Celebrate Success! I love to celebrate learning. We just held our Environmental Conference as the final lesson in the TechnoEnvironment technology project. It was such fun! At our Environmental Conference students assumed the role of environmental scientists, working for the TechnoSuzuki Foundation. We held the conference in the classroom. NOTE: The TechnoEnvironment project has been a favorite for many years. Unfortunately, it is no longer available. To find other TechnoKids projects related to web design view the Project Matrix or visit the TechnoKids website. To prepare for this event, pamphlets created by the students were distributed around the room. Each one stood up on a desk with a response sheet. 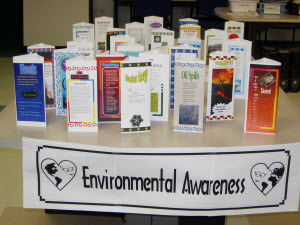 The response sheet read, Your environmental pamphlet looks great! Below was space for peers to write one thing that they liked about the pamphlet. To prepare students for the peer review activity, we had a discussion about the TechnoEnvironment technology project. First, I outlined the technology skills that we had focused on throughout the past few weeks while making the postcards, posters, and pamphlets. Then students examined the pamphlet on their desk. Together students generated a list of positive comments that they could say about the publication. For about ten minutes, students rotated from seat to seat providing feedback to their peers. They were told that each comment had to be unique. In other words, they could not write, “I love your border!” on each one that they reviewed. They were allowed to review their own work. I thought it was important for them to realize their strengths and feel pride in their work. Since we had a few students away, I participated in the review and I was able to offer my own observations. It also gave me a chance to read student comments. I was impressed with their insights and encouragement. Cupcakes served as part of the environmental celebration. Next, we took a break. Refreshments were served which included juice and cupcakes. The cupcakes had blue and green icing swirled together to look like the Earth. Why should people be concerned about this environmental issue? In light of recent events do you think this is a solvable problem? What do you want kids to know about this environmental issue? Together the scientists would present their response. Often they would conference with one another before offering an answer. The presentations were brief so that everyone could have a turn. Some students are nervous when public speaking. To lighten the mood and make the conference fun, I provided black rimmed glasses, similar to what a stereotypical scientist would wear. Presenters had the option of wearing the glasses while at the front of the room. It was amazing to watch the transformation this small prop provided. Students acted like scientists and would answer their questions in character. They were high quality responses and so entertaining! If you have been following the TechnoEnvironment blog series you know how often I was worried about completing the project in time. As a result the final task was modified from a six panel pamphlet to a three panel pamphlet based on the Session 4 Skill Review. Despite the time constraints, the Environmental Conference class was never an option to remove from the schedule. I think that it is very important for students to celebrate their success and reflect on their learning. I had such a great time working with the Grade 8 students. I have provided some links for you to review some of their publications. I think you will agree – they are excellent!